Opening Reception: August 31, 6 – 9 p.m. Artist Talk: September 16, 2p.m. Opening Reception: Friday, May 5, 5 – 7 p.m. Hours: Monday – Friday, 10 a.m. – 5:30 p.m. and Saturday, Noon – 4 p.m. Hours: Wednesday – Saturday, Noon – 5:30 p.m.
August 12 and 13, 2017, 12 noon – 4p.m. March 25 – 26, 2017, 12 noon – 4p.m. July 10 – 20, 2017, noon – 4p.m. “Brown Bag It” . . . Creativity in a brown paper bag! 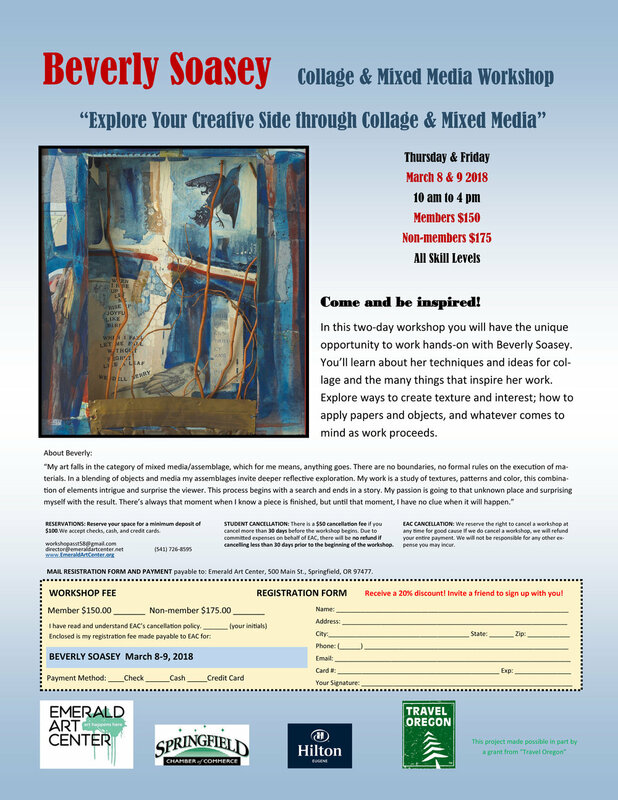 This collage – mixed media workshop is designed to free up your overwhelming temptation to come to a workshop already knowing what you want to do. Free yourself from pre planning and the worry about what to bring, at least for the first day. Each student will receive a bag of surprise collage materials. This is intended to spark creativity in a new way. I'll share many ways that you might approach your project. My passion for collecting and combining objects and materials, is what I want to share in this workshop, and how to look at things differently and get the creative juices flowing. When you come to the workshop, plan to have at least one 10" x 10" wood panel. After the first day working with the materials found in your bag, you will be free to try different panel sizes, paper, canvas, as well as adding your own collage materials if you choose.